From Barre I continued up state route 14 to and then east on US 2 to the town of Plainfield, just east of Montpelier. 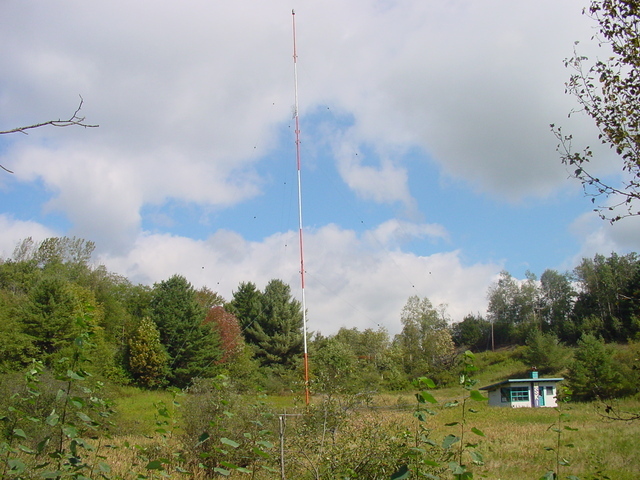 While we found the campus of Goddard College (or at least what's left of it after recent financial difficulties), we did not see any sign of the campus radio station, WGDR (91.1)—although it did seem to be on the air. After giving up on finding WGDR I headed back west on US 2 into Montpelier, looking for my next stop, Northeast Broadcasting's River St. studios. Before I got there, I found the other graveyard AM in this little market, Northeast's WSKI (1240 Montpelier), conveniently located near the Winooski River (that's Algonquian for “Onion”) at the intersection of US routes 2 and 302. As the jock on WNCS was noting, and rather conveniently for me, the rain and overcast conditions which had plagued me in my trip thus far finally lifted, resulting in what may be the best photo I've ever taken of a graveyard AM transmitter—and it's a flagpole tower to boot!